Leakage of agricultural pipes has been increasingly frequent problems due to corrosion, loosening of joints, and cracks, which result in the subsidence of peripheral roads and dwelling land in the worst case. Generally, leakage has been detected by listening for noisy leak signals or measuring water loss during 24 h in a section closed by a valve. But these methods have weak points: They are costly, inaccurate, and time-consuming. 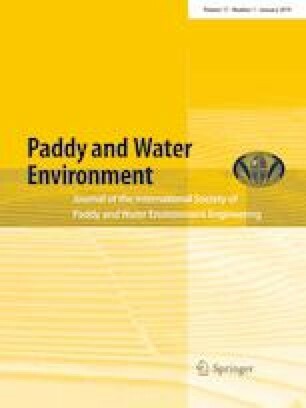 This study investigated a new method of leakage detection that is accurate and easily accomplished by monitoring pressure for the purpose of preventing the destruction of pipes. During a transient event, where a large pressure wave is generated suddenly by sharp valve closure, the pressure wave damps out and the reduction wave is reflected when passing through a leakage point. Applying the propagation characteristics to leak detection, two methods were proposed: In the first method, a location and leakage volume was estimated by reading the signal of reflected wave from the leakage point and the validity of the method was confirmed by experiment in case that the ratio of leakage volume to flow rate in the pipe was more than approximately 5%. In the second method, which focuses on damping of pressure due to leakage, the leakage location could be estimated with an accuracy of < 5% of the total pipe length by fitting the calculated “damping rate” to the measured “damping rate” using method of characteristics in the cases where the leakage could not be detected by the first method.